I do not get a call often to photograph a marriage proposal, but given it can be - no, is - as important as a wedding, I make sure things go as planned. So I come in contact with Josh. Josh and Jaime are in a long distance relationship, he in North Carolina and she in Ohio, but will be rectifying that soon. So they decided to have a romantic weekend midway, which placed them in the Smokies. But Josh wanted to use the opportunity to propose marriage. He and I discussed various spots, such as Cades Cove and Greenbrier. But in the course of the conversation, he kept coming back to one place: Grotto Falls. 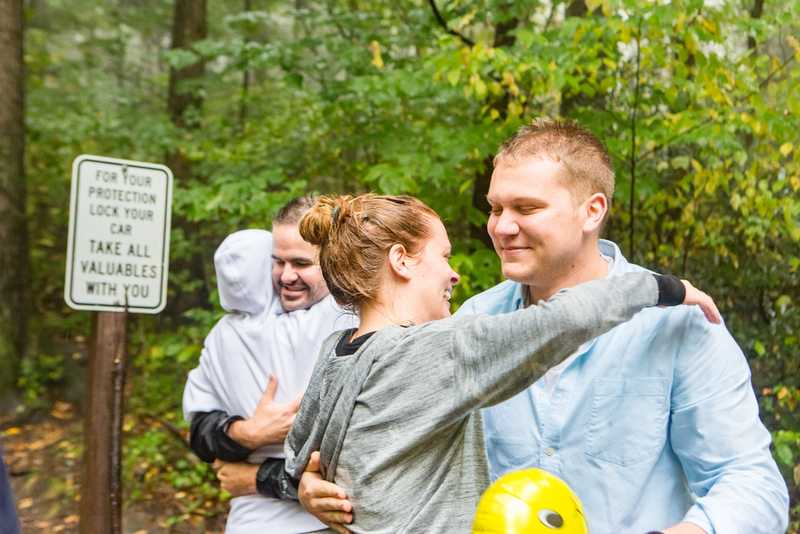 He wanted to propose next to a water fall in the Smokies, just for the sheer romance of it. Not that I blame him - the Smokies, especially in Autumn, is a magical place. I had to give him some caveats, though. He was hoping for privacy but the second weekend with most families on Fall Break is NOT the time to look for solitude in the Gatlinburg area. Nonetheless, Josh wanted the waterfall and we agreed that was the spot. Now I had never been to Grotto Falls before. I knew it was off the Roaring Forks Motor Nature Trail, a one-way loop that brings one to the Trillium Gap trailhead. From there, it is a 1.4 mile climb to the falls, with an elevation gain of just over 500 feet. So the Monday before the getaway weekend, I went out to the trail . . . and hiked to the falls. I am glad that I did - that allowed me to time the pace of the hike, as well as check out the four streams that need to be crossed and determine the best place to have Josh stand when he proposed to Jaime, so I would have a vantage point with a camera. I took pictures, as shown above, to send to Josh so he would know what to expect. I guess my Army days of reconnaissance came in handy. Did I say Josh wanted privacy? Now it is Saturday morning and . . . it is raining. Not a downpour, but not a drizzle, either. I had spoken with Josh the night before and he let me know, come rain or shine, he and Jaime were going to do the hike. Okay, for that reason alone, he needs to marry her, the fact that she is wiling to wake up early on a Saturday morning and head up what had become a very muddy trail because her boyfriend really, really wanted to see these waterfalls. And ain't nobody else was fixing to do this same thing. I got there ahead of time and realized, I was hiking this alone. There was no one else around in the wet gloom. Carrying my gear - which included an extra camera body and lenses since there was no room for error on this job - and with my hiking boots on, I headed up. Okay, there is something to be said for solitude in the mountains. I met one person coming down on the trail; otherwise, it was me and the occasional suspicious noise in the brush. I got to the top and set my camera on a tripod to look like the "nature photographer," that crazy type that doesn't stay in a dry, warm bed on a wet, chilly weekend morning. On cue, Josh and Jaime showed up. Josh was good - he got Jaime to "the spot." Josh leads Jaime from behind the waterfall - this is what makes Grotto Falls a "grotto," as you can walk through a small grotto behind the water. Let's let the story unfold . . .
Got to have a little pre-proposal snogging. "Wait a sec, what's happening now?" After spending some moments together, Josh looked up at me, waved, and yelled, "Hey, Stephanie!" Laughter all around as Jaime realized that this was a set up, and her now fiance had arranged for the moment to be captured. A portrait of the happy couple, using a bit of slow shutter to turn the falls to candy floss. But the story does not end here. Josh had arranged for Jaime's family to drive down from Cincinnati that morning to be with them in celebration. So while he said, casually, "Oh, we're going to check out a little bit more of the trail . . ." I said, "Yes, well, I gotta get to my next shoot," and headed back down. 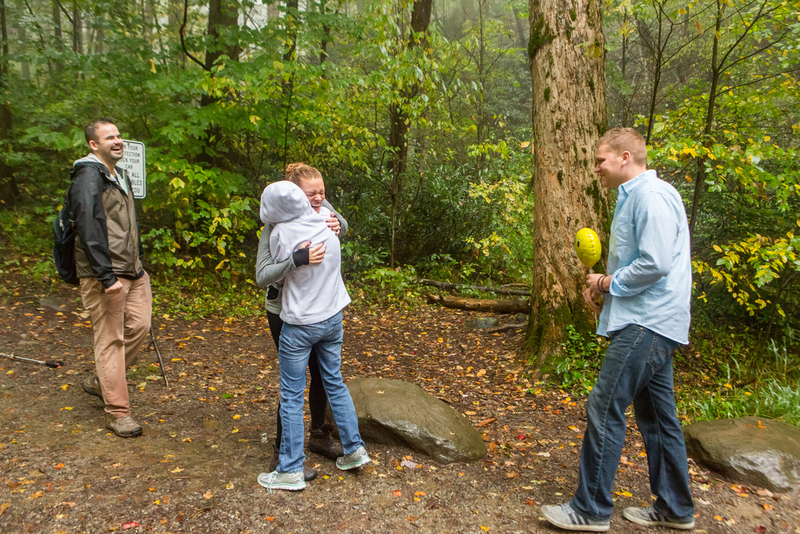 Which wasn't a lie - Jaime just didn't know that my next shoot was her family surprising her at the trailhead. Look, when you ask someone to marry you, you are hoping that it is a moment that happens only once in your lifetime. All the more reason to make sure someone is taking pictures. You don't have to acknowledge the photographer - you can just as easily arrange that the photographer take the pictures surreptitiously, and later surprise your beloved with a picture book or even a slideshow at the wedding reception. But it is a cool thing to have in pictures, especially once your family starts to grow. What kids wouldn't want to see those images - or grandkids, for that matter! And if you find a photographer who wants to make sure it is a special moment, even to the point of scoping out the spot and reporting back . . . well, if you don't, give me a call. You get your "Yes!" and I get the shot. For fun, I put together a small online flip book for Josh and Jaime, so they can share the story more easily on social media. Was it wet? Yep. Was it muddy? Yep. Was it worth it? You bet!